The Alexander Muss High School in Israel (AMHSI) and Jewish National Fund (JNF) believe in the potential for tremendous impact the next generation of Jewish leadership will have visa vie Israel and the extended Jewish community. In light of the challenges Jews face today both in Israel and around the world, today’s high school students require an even greater investment unlike previous Israel programs, in preparation to become the next generation of Jewish professionals and lay leaders. 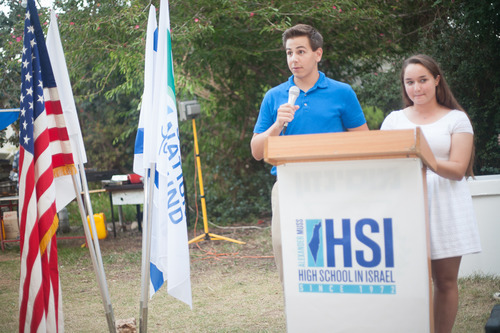 The Impact Fund was created by AMHSI and JNF to identify outstanding students and provide them with a transformative Israel experience that will enable high school students to explore their identity and discover their own connection with Jewish culture and history, Israel and her People. The Impact Fund is a merit based fellowship grant offered to exceptional high school students of diverse backgrounds who demonstrate leadership qualities, academic achievement and potential to be a future Jewish community leader. Following a nomination and admissions process, students accepted to the fellowship will attend a six week AMHSI program during or following their junior year of high school. As fellows, students will be expected to fulfill certain expectations prior to and following the program all as part of their transformative journey towards becoming an Impact Fellow and making a lasting difference in their communities and beyond. AMHSI enables students to experience Israel as a classroom. Students are taught by AMHSI’s experienced and passionate educators who become the students’ mentors, inspiring them to live outside their books, encounter new ideas and challenge themselves in infinite ways. For the 23,000 alumni over the past 42 years, the impact of the Alexander Muss High School in Israel is reflected in their ongoing commitment to Israel, to Jewish life and to making our world better. The Schwartz-Hammer AMHSI Impact Fellowship Program is the first program of its kind. Through the generous support of the Schwartz-Hammer foundation, fifteen high school seniors from Arizona, five over each of the next three years, will be able to participate in fully funded AMHSI program. For more information, please click here.